There is little doubt that Nathaniel Hawthorne's interest in the Puritan mistreatment of Quakers and the later persecution in Salem of those accused of witchcraft during the terrible summer of 1692 grew out of a personal sense of involvement in these dark chapters of Salem history. 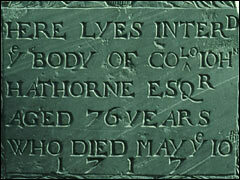 Hawthorne's ancestor, William Hathorne was instrumental in the scourging of Quakers during the 1650's and William's son, John, was among those who sat in judgment of those accused of witchcraft almost forty years later. Shy and almost reclusive, Hawthorne may have felt a special kind of empathy for those so publicly and unjustly tormented and may have felt a peculiar and disagreeable connection to those early members of his family who were partly responsible for that torment.